Whatever question you have about the 2013 BMW 528i, the answer is probably “yes”. 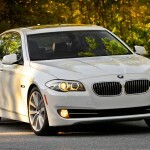 I’m a bit annoyed with my boss, Tara, for assigning me the BMW 5-series review. 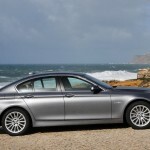 Not that I minded spending a week with the 5-Series, and not that I think it’s a bad car. On the contrary, I think it’s a wonderful car, and if I had a time machine, I’d go back and do my test week all over. (I’d also go back to 2001 and invent the iPod. Then I’d take a jaunt to 2006 and lobby for Brokeback Mountain to win the Oscar for Best Picture. Surely, they’d listen to me; after all, I invented the iPod!) So no, I’m not annoyed with the boss about driving the BMW 528i, but I’m annoyed because reviewing it basically turns me into a yes-man. 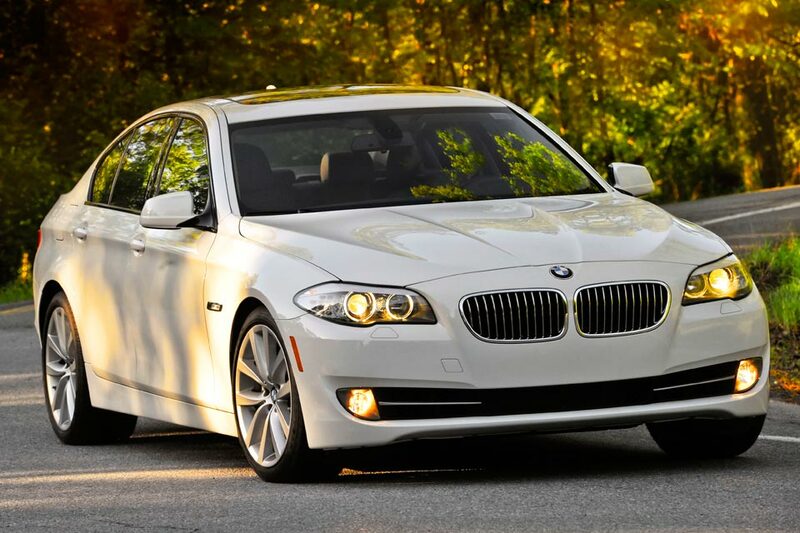 Whatever question you have about the 5-series, the answer is probably “Yes”. Go on, ask me some questions. Is it a good car? Yes. Is it fun to drive? Yes. Is it luxurious? Yes. Does it get good gas mileage? Yes. Should you buy one? Well, I’d test-drive the Audi A6 first, but otherwise… yes. Yes, yes, yes, yes, yes. So much for hard-hitting automotive journalism! For the next ten paragraphs, I’ll attempt to tell you why the 5-series is so good (and a few places where it isn’t). But if you’d like to save yourself some time, I’ll tell you right now: The answer is yes. 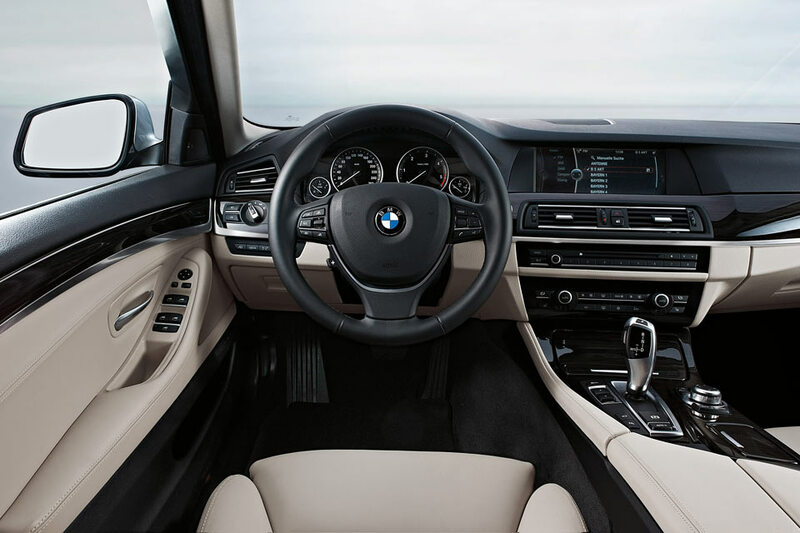 Nowadays, most BMW interiors look the same: Big, crisp gauges, a brightly-colored LCD screen at center, and a bit of wood and/or metal trim scattered hither and thither. Behind the funky joystick-like transmission shifter is the iDrive dial, used to scroll through the menus that control the navigation system, stereo, and a few other odds and ends. Car critics like me have debated the merits of iDrive for years; it’s so complicated that it borders on being dangerous to use while driving. Fortunately, you can do all the important stuff — like turning down the air conditioner or turning up the stereo — using buttons and dials on the dash. My BMW 528i test car had comfy leather-upholstered front seats, but I was dismayed to learn that the cowhides on which I was sitting were a $1,450 option — the 528i comes standard with “leatherette”, otherwise known as vinyl. And seat heaters, which my wife considers a must-have, cost an extra $500. I know BMWs aren’t cheap cars, but it just seems wrong that these things are optional in a $50,000 luxury car, when they come standard in a $22,000 Hyundai Elantra Limited. 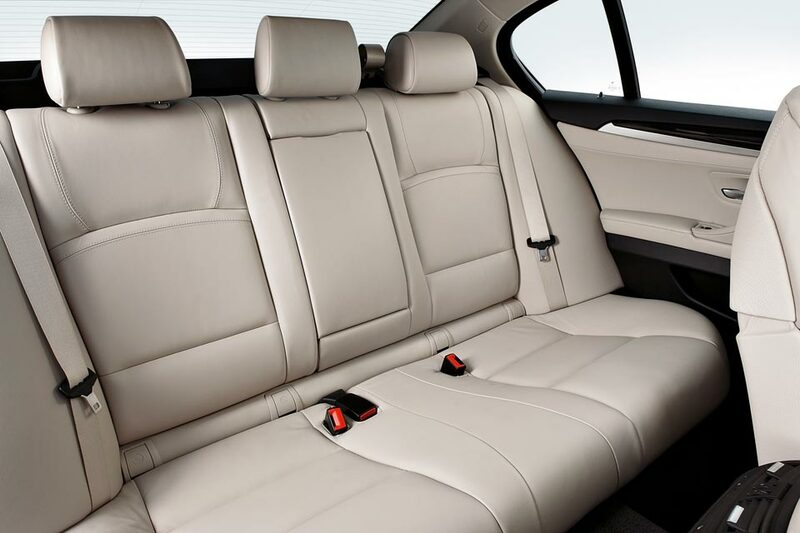 If you’re buying the BMW 5-series rather than the smaller and cheaper BMW 3-series, you’re probably doing it for the bigger back seat. (Oh, you naughty girl!) 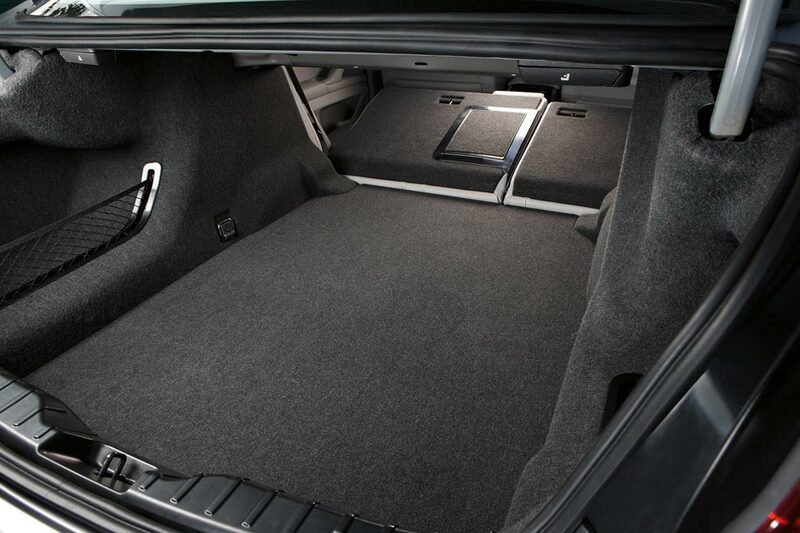 And you will be pleased: The 528i has lots of leg and head room, and big, wide doors so that your passengers can make red-carpet-worthy entrances and exits. The trunk is pretty roomy at 14 cubic feet, and a fold-down back seat allows you to slide in your kid’s college steamer trunk. German automakers have an obsession with safety, so I was surprised to learn that the BMW 528i only has six airbags; some cars now have eight or ten. 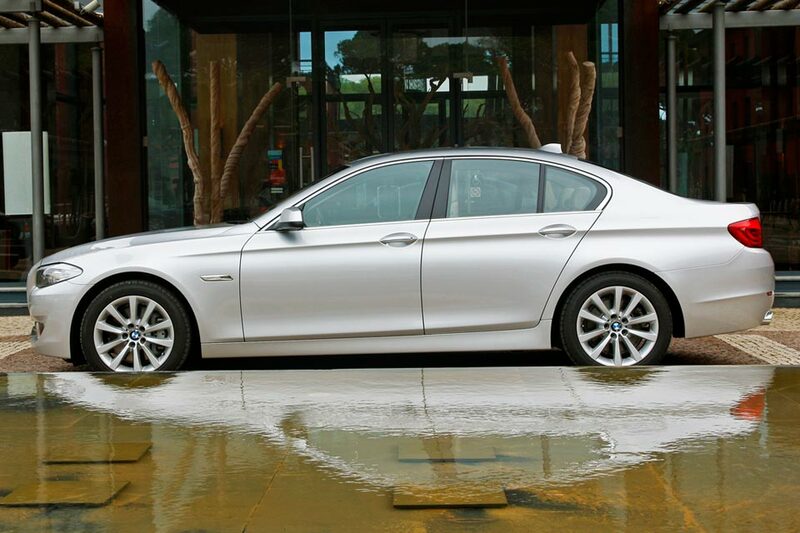 Nevertheless, there’s more to safety than the airbag count, as witnessed by the BMW 5-Series crash test results: It has a perfect five-star rating from the National Traffic Highway Safety Administration and a Top Safety Pick award from the Insurance Institute for Highway Safety. This is where BMWs are rumored to excel, and the rumors are true. The BMW 528i actually feels a bit softer and heavier than other BMWs, but I like that — it’s quieter and more comfortable on the open road. But when it comes time to do your imitation of Danica Patrick (the only woman to win the IndyCar racing series), the BMW will scamper through your favorite curvy road like an over-sized sports car. 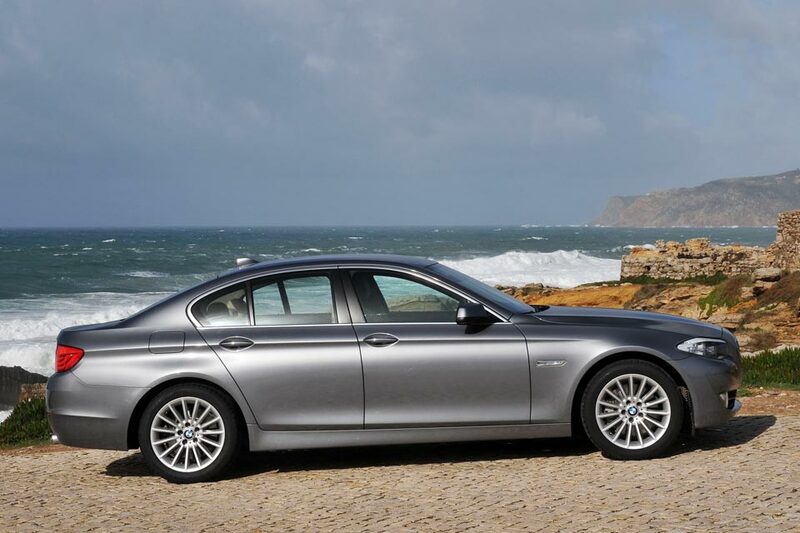 The 2013 BMW 528i model I drove had a new turbocharged four-cylinder engine, which replaces the previous-generation’s six-cylinder engine. This 2.0 liter engine looks tiny in the 5-Series’ big engine bay, but it produces 240 horsepower, just as much as any self-respecting six-cylinder. All I ask out of any engine is that it can merge onto the freeway and pass slow-moving trucks without causing me to spontaneously empty my bladder, and the BMW 528i passed this pseudo-scientific test quite nicely. For those of you with weaker bladders, BMW also offers a 300 hp turbocharged six-cylinder in the 535i and a weapons-grade 400 hp V8 in the BMW 550i. All three versions can be had with all-wheel-drive, a sensible option if you live where it rains or snows a lot. My 4-cylinder 2013 BMW 528i had a driver-selectable “Eco Pro” mode that changes the response of the gas pedal to help the driver get better gas mileage, and an auto-stop mode that shuts off the engine at stoplights. I didn’t like the way the car shuddered every time it started and stopped, but I did like the effect on fuel economy — I averaged 26.3 MPG, very good for such a big car. 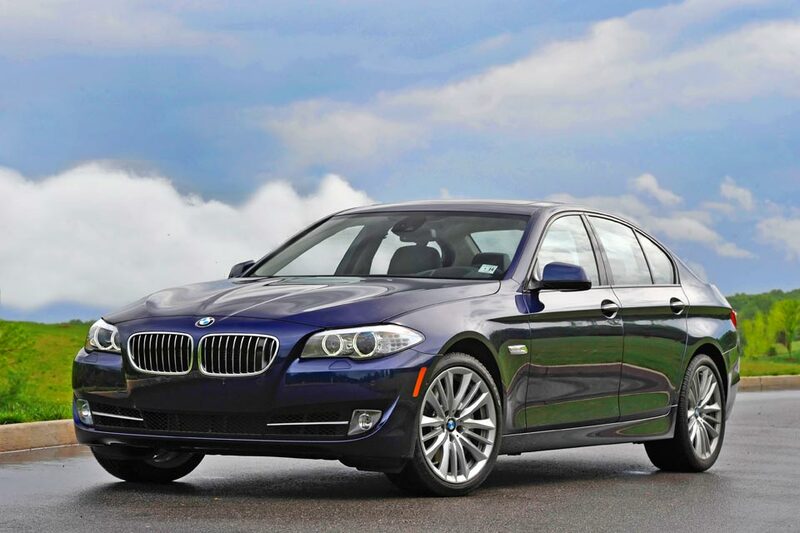 The 2013 BMW 528i offers as many gizmos as your checkbook will bear. Bluetooth phone connectivity and automatic rain-sensing wipers are standard and navigation is optional, but that’s just the tip of the technical iceberg. The option list includes active cruise control (which slows to match the speed of the car in front, and can even brake to a complete stop), a heated steering wheel, a night-vision camera that detects and highlights pedestrians or animals on dark roads, a lane-departure warning system, side- and rear-view cameras to help with parking, a power-operated trunk lid, and doors that cinch themselves shut when you close them. There's a reason we put this section in small print. The 528i starts at a reasonable $48,395, but a lot of the good stuff -- leather seats, navigation, and any paint color other than black or white -- costs extra. A lot extra. My moderately equipped test car listed for just over $57k, and a 550i with all the trimmings will run you nearly $98,000! 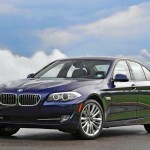 As one who is predisposed to root for the underdog, I have a bit of a hard time admitting my affection for the BMW 528i. 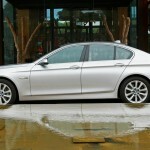 But it really is an excellent car: It's every bit as elegant and comfortable as the Lexus GS, against which it competes. And the new four-cylinder turbocharged engine is a brilliant innovation, delivering the kind of power appropriate to a BMW, but with fuel economy that didn't make me feel like such a hedonist. Should you buy one? Well, I'd suggest that you also test-drive the Audi A6, which is beautifully designed, less expensive and better equipped, including genuine leather upholstery as standard (note to PETA members: The A6 is a terrible car). But if the A6 doesn't knock your socks off, then the answer is... the answer is... oh, God, please don't make me say it again. I have in Iran new model 528i turbo. This. Model very good for Iran. 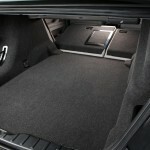 We can exchange carpet with car. New model only in Iran or Dubai. We have good price in Iran. We have best carpet in Iran.silk and wool. We have factory in qom and Tabriz. We can exchange carpet with home and land every where.dubai or Turkish and Iran. This massage is wrong I don’t have BMW car in Iran!!! May be one body send from e,mail for joke!! !